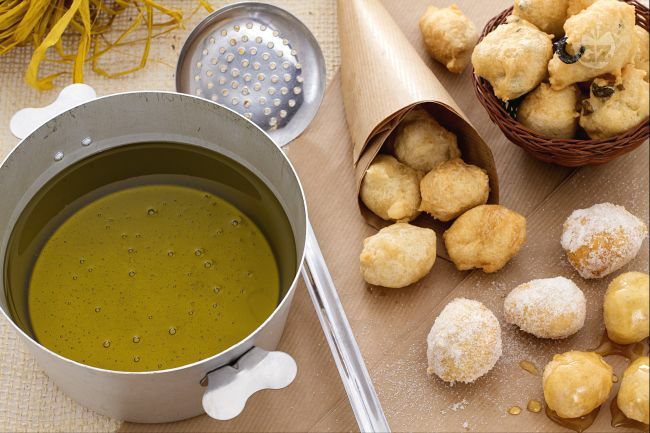 Pettole are small dough balls fried in oil and dusted with sugar. They are particularly popular during Christmas, Easter and other celebrations throughout the Italian calendar. They are easy to make and delicious, and don’t contain any calories, honest! Mix the flour with the mashed potatoes, yeast and add a little warm water to form a dough. Cover with a damp cloth and let it rise for approximately 2 hours. Then, simply create bit sized balls and fry them in the hot oil. Remove with a slotted spoon and sprinkle with sugar. They can also be drizzled with honey, stuffed with hard ricotta or various other savoury filling.